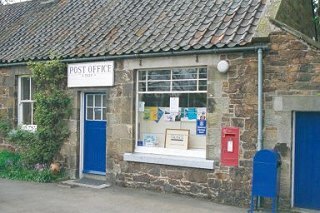 A hamlet in East Lothian surrounded by fertile farmland, Drem lies 4 miles (6 km) north of Haddington in the shadow of an ancient hill fort called the Chesters. Now designated as a Conservation Area, it is situated on the main line railway to England at its junction with a branch line to North Berwick, and the settlement is dominated by its railway station. An airfield established here during World War I became a significant fighter base during World War II, its fighter planes intercepting German raids over Britain en route to the naval base at Rosyth. Drem also gave its name to a lighting system used to enable aircraft to take off and land in bad weather and at night that was pioneered at RAF Drem.